Green juice is aaaamazing. Like many people, adding green juice to my diet really changed my life. It actually changed my entire outlook on life and health. It changed the way that I view the world and it changed my relationship with my body. Since starting to juice, I’ve learned to listen to my body, to nourish it, and to rest it when needed. Whenever I feel sluggish I blast my body with juice. You can take in a vastly condensed amount of vitamins and nutrients from fresh vegetable juice. Most people just don’t get enough fruits and vegetables. How many servings do you think you really consume every day? Most people only get 3-4 servings a day, if that. We should be consuming 9+ servings. Including more vegetables in your diet can help to regulate your blood sugar and prevents heart disease, cancer and other illnesses. Vegetables are the key to optimal health. Sure, eating fruits and vegetables in their natural, whole state does provide us with vitamins and minerals but the fact is that you just can’t consume as many vegetables as easily eating them whole as you can juicing them. And in fact, it’s only possible to obtain the maximum benefit from them when they are juiced because a lot of the goodness is locked in the fibre which our bodies expel. Juicing allows you to squeeze out all that goodness and separate it from the fibre so that juice is actually full of goodness that you wouldn’t be able to absorb if you were eating the full produce. Their goodness is released from the fibre and we are able to drink their highly concentrated nutrients which are able to enter our bloodstream very quickly. Because juicing strips away the fibre and just squeezes out all the photonutrients, so it’s easier on your digestion. Your body won’t be busy breaking down the fibre and you can absorb the benefits of the juice more efficiently without feeling full and bloated the way that you might if you were to sit down and eat a giant bowl of cruciferous vegetables. Fibre is essential to health, so be sure to continue eating raw fruits, vegetables, legumes and whole grains in conjunction with fresh juices to gain the maximum amount of nutritional value from what you eat. Very few people eat enough raw fruits and vegetables. Juicing provides a quick and easy way to increase your consumption of these foods, and is recommended in addition to a high fibre diet. It’s still important to also eat entire vegetables and fruits in their whole form because we do need the fibre. Whether whole or juiced, fresh produce is full of minerals, vitamins, essential fatty acids, carbohydrates, and proteins that we need, juiced, blended or chewed. Just remember that drinking green juice will allow you to blast your body with 4-9 servings in a single glass of juice! That’s why juicing is so amazing! Fresh vegetable juice is especially excellent to drink in the morning, before or with breakfast. I have some general advice and rules of thumb that will help you with your juicing. You can also follow specific juicing recipes, but once you get the hang of things, these basic principles will allow you to get creative with your juice. First, let me just say what you probably already know. Organic produce is best. Whenever possible, choose organic, particularly for the items listed on the Dirty Dozen list. Unless it’s a heatwave outside, it’s a good idea to let your produce come to room temperature. Particularly in the winter when it’s cold outside, you might not realize that your juice is giving you a chill until it’s too late. Keeping your produce at room temperature before you make your juice is a good idea, especially when you’re juice feasting. If you’d like to incorporate juice into your mornings and you’re pressed for time, it’s a very good idea to wash and even chop your produce the night before and leave it on the counter so that it’s ready for you the next morning. While some items, like organic cucumbers, don’t take much time to prep, leafy greens can take a while to wash thoroughly. Getting this done the night before can really make your morning juicing habit that much easier and therefore that much more of a habit. I’m always surprised by how long it can take to do something even as simple as chop a few carrots when I’m pressed for time. Save yourself some hassle and organize in advance. You can even wash and prep several days worth of produce at once in advance, however it’s important that everything is dry before you put it back in the fridge. Greens in particular will wilt and spoil much more quickly when they’re stored in the refrigerator while wet. For citrus fruit, I cut off all the white pith before I juice it as the pith is very bitter and will affect the flavour of your juice. If you have an auger-type juicer like the one I have (the Omega 8006) be careful of long stringy vegetables like beet leaves. They can wrap around your auger and get stuck. Chip the long strands in to short enough pieces that they can’t wrap around your auger. If you aren’t following a specific juice recipe and you want to start to create your own juice combinations, there is a very good rule of thumb: pair juice ingredients by colour. Vegetables in the same colour-group are more likely to taste good together. The juice will also be more visually appealing when it doesn’t turn out a muddy colour, but most important the flavours do tend to balance out better together when you stick to the same family of colours. Keep the greens together. Reds, oranges and purples work together. Yellows or whites can be paired with either colour group. Mixing high water content vegetables with lower water vegetables will not only give you a more efficient yield but also better tasting juice. It’s also way more cost-effective. My favourite high water content vegetables are cucumber and celery. Leafy greens have very little water content, so you’ll need lots of them, and you’ll need to pair with high water content veggies to produce enough juice. Alternating back and forth between high and low water content produce is a good idea when using an auger-type juicer; it will run more efficiently and will prevent it from clogging up. Fruit like apple, pear, or citrus has a high water content and can be used with low water content vegetables like leafy greens, but don’t rely on fruit, as per my next point. Fruit, though good for you, contains a lot of sugar. When you eat fruit, the fibre of the fruit balances with the sugars and doesn’t have such a strong impact on your blood sugar levels. However, when you juice your fruit, it strips out the fibre and fruit juice can really cause an immediate spike to your blood sugar which you want to avoid. Use fruit only sparingly, when you really need it for flavour. Get in to the habit of reaching for citrus flavours like lemon and lime, ginger, and sauerkraut as flavour enhancers first and fruit only on occasion. This extra step can be a bit of a pain, but vegetable juice can be a bit unpleasant when it’s full of pulp. I like pulp in fruit juice but not so much in vegetable juice. It’s worth getting a fine strainer and taking out the lumps and bumps before enjoying your beverage. It’s a good idea to wash your juicer soon after making your juice so that the acids and sugars don’t cause wear on your equipment. However, don’t wash and put away your juicer until you’ve tasted your juice. Sometimes the flavour needs to be tweaked a little. Better taste it first. Once you’re sure that your juice is tasty, get into the habit of washing your juicer right away and avoid letting it sit around, especially over night. Juice can be kept for up to a day in an air tight container in the fridge, however the fresher the juice, the better it is for you. The nutrients breakdown as the juice begins to oxidize. A brown or dark bottle will help to keep your juice fresh. There are several kinds of juicers. What it really comes down to is, for the purpose of juicing leafy greens, only certain kinds of what’s called *slow juicers* will do the trick. I have an auger slow juicer, the Omega 8006. I love it. Where with blenders you might be able to get by with various types of equipment, with a juicer it has to be able to extract the juice from the leafy greens or you’re going to be stuck juicing carrots, cucumbers, and celery. Green juice is extremely powerful and healing. I take a break from solid food a few times a year to juice “feast” as many of us juicers like to call it. Sometimes I just take a day, and sometimes I take as long as a week. I know people who have juiced for as long as 60 days. 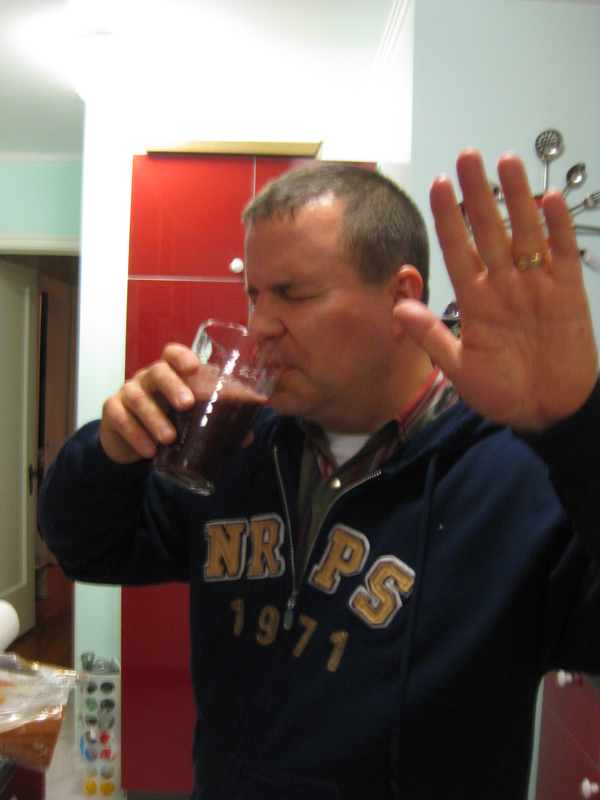 People have cured all sorts of illnesses from vegetable juicing, from cancer to diabetes. This vibrant red juice is a great example of why colour grouping works so well when you’re juicing. This nutritious green juice is refreshing and invigorating! The addition of the sauerkraut makes it full of probiotics, which makes it great for your digestion. It’s also tangy and very yummy–quite different from the usual green juices that include lemon. Tomatoes, green onion, celery, and raw sauerkraut make up this delicious and unique juice. A delicious and blood sugar balancing combination of swiss chard and cucumber with just a hint of green apple. Cleansing Green Juice - Wake Up with some Zing! Dandelion is amazingly powerful stuff, but it’s also strong. In this juice combination, the fennel balances the strong flavour of the dandelion to create a fragrant, tasty juice. It’s filled with antioxidants. Bottoms up! Dandelion greens are powerful! This is a strong juice with positive, visible effects. If you’re looking for the best natural solution to dark circles under your eyes, this is it!